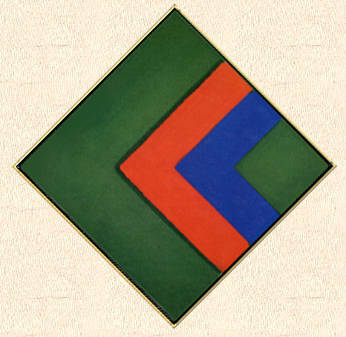 A DEVELOPMENT OF the "chevrons," the Diamonds (1964-69) were Noland's first shaped paintings. The interaction of color and layout involved the picture shape itself. The "Square Diamond" format (1964-65) took the chevron motif into the domain of the shaped picture. In this format the sides of chevrons aligned with the sides a square picture hung from its corners as a diamond. The chevron motif sprang into being only when the square canvas was hung this way; as a horizontal square the chevrons remained inert, equal-sided "L" shapes. Because external shape and orientation determine the character and expression of depicted shape, this reversed the terms of traditional art. Picture shape had previously been a passive container; in the square diamonds an active shape energized what would otherwise have been a passive motif. Although simple in appearance, the "Narrow Diamonds", which followed in 1966-67, are some of Noland's most brilliant and radical paintings. In effect the square diamond motif was squeezed into a narrow, elongated panel: instead of containing an emblematic motif, the painting itself became emblematic. In these paintings color, used with the precision of notes in a scale or chord, was often arranged in equal steps from dark to light, this unlikely arrangement dissected chiaroscuro, transforming it into measured relations of color. Whereas shading in abstract painting usually punched holes in the picture surface, here eccentric picture shape held the shading flat.